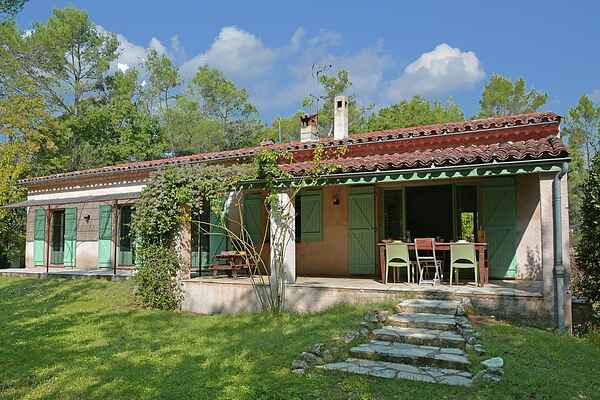 Comfortable holiday home in Seillans. Nearby are several, charming Provencal villages, each with their own lively market with fresh local products. Thanks to its location in the woods you easily walk into nature for a nice hike or bike ride. You can also go canoeing or paddle boating on the Lac de St. Cassien. The beautiful sandy beaches of Sainte-Maxime, Fréjus and Saint-Raphael? By car you are there in no time. Its location is on the edge of the forest, just outside the medieval village. The large natural garden is fenced and has the many (olive) trees. For the children there is a climbing frame, a swings and a slide available. There is also a terrace where you can eat or have a drink together. From the terrace you look out over the fenced swimming pool with its sun terrace, where sun beds are waiting for you. Inside is a spacious living / dining room with patio doors to the terrace and a separate play area with toys for the children. The kitchen is fully equipped. Three of the four bedrooms, of which one with an en suite bathroom, have patio doors, so in the morning you can immediately enjoy the sun!